All the eyes of the theatre world might be on Edinburgh at the moment, but for those northerners who’ve stayed at home there’s been another big thing: the 60th anniversary of the legendary Stephen Joseph Theatre. Sadly, I didn’t make it to the day when all three theatres (their current site and their two predecessors, the library and Westwood) were open for celebrations, but the main attraction for me was the plays. I even had to do some complicated and cunning travel plans to fit them into my busy summer schedule. This year, their summer season consists of reprises of some of the famous theatre’s greatest hits of the last six decades. And Cox and Box. Oh. But never mind, the rest of the line-up looked very tempting. And with the three headline shows done over the summer, let’s have a roundup. I’m not going to do a detailed critical analysis of these plays because they’re all huge successes that don’t need my help, but I’ll quickly chip in what I thought. COMMENT: It was wrong to call for Kate Smurthwaite’s gig at Goldsmith’s to be cancelled – but there’s little evidence that Smurthwaite’s own attitude to free speech is any better. I know I’ve just done a comment post on freedom of speech, but since I decided I was going to write about David Greig’s “Welcome” to the “Fringe” scheme (punctuation mine), another show that’s the subject of censorship came to my attention. It’s Kate Smurthwaite’s The Wrong Sort of Feminist, and this all relates to a stupid incident earlier this year when a gig of hers was cancelled following a feminist protest to have her no platformed. Whether this feminist protest was actually behind the cancellation is a bit a puzzle – Goldsmith’s comedy society claims it was mainly down to poor ticket sales – but Smurthwaite has nonetheless chosen to wear this as a badge of honour and theme her 2015 Edinburgh Fringe show around it. I would probably have taken no notice of this had I not been given one of her flyers. I found her level of self-promotion a little irksome (okay, Edinburgh Fringe publicity has to be self-promotional, but this was a tad too narcissistic for my liking), but that’s not the problem. 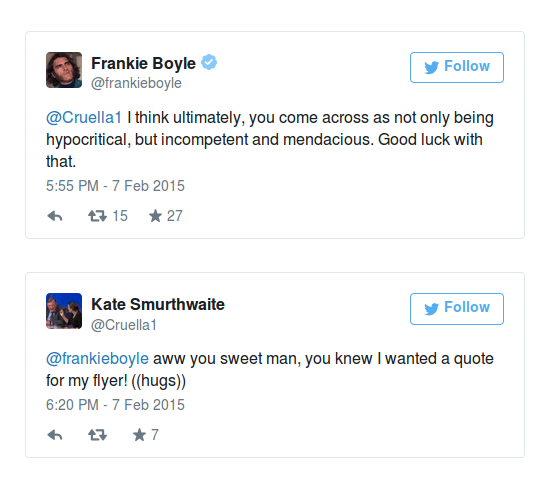 The problem I really had was the way she used a recent Twitter spat with Frankie Boyle on her flyers, as if a derogatory tweet from him is a second badge of honour. That’s gone one step too far over the hypocrisy line. Welcome to the fringe? Pull the other one! 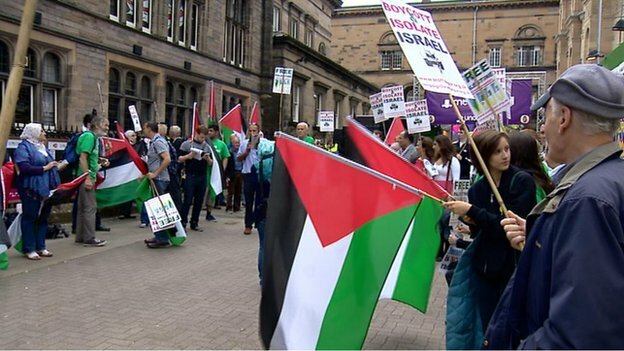 COMMENT: There’s nothing wrong with supporting Palestinian artists coming to the Edinburgh Fringe. But don’t be fooled by this talk of “free Israeli voices”. One theme that has kept cropping up in this year’s Edinburgh Fringe is censorship. The University of Edinburgh has just held an event called “Theatre Censorship Now“, and Underbelly has programmed a series of plays Walking the Tightrope to discuss this very issue. I think we can safely assume that this is entirely in response to the protests that led to the cancellation of an Israeli play last year, because arts subsidies from the Israeli government is all sinister propaganda to make wars look good which is why all the UK artists nobly stuck by their principles and refused all money from the UK government. Possibly. I have already said what I think about the boycott, and what I think about the demonstrators demanding the boycott, and if you haven’t read those articles all you can probably guess how contemptuous my opinion is. COMMENT: Richard Herring has chosen to stop doing the Edinburgh Fringe. Other comedians may follow suit. Here’s why this might be a good thing. In my gap between fringe visits, I’m going to turn my attention to a story that raised a few eyebrows three months ago. Comedian and long-standing fringe regular Richard Herring said he wasn’t going to take part in the Edinburgh Fringe this year. There were two main reasons he gave, but the first reason is a common complaint of lots of comedians: it’s not worthwhile any more. Herring’s last straw was paying through the nose for a substandard flat for a month. There’s also a problem (not raised by Herring personally but a problem nonetheless) that even established comedians can end up making a massive loss at Edinburgh if things go wrong. Richard Herring is not the only comedian who’s unhappy about Edinburgh. In fact, there so much grumbling that there was even talk a few years back of having a breakaway “London Comedy Festival”. This idea is, so far, only a hypothetical proposal, but presumably the idea would be a festival as high-profile as Edinburgh (at least for comedy) where the big-name comedians could perform high-profile gigs without the expense. Not sure who they intended would to perform in it, but my guess is it would work on invitation – and therefore it’s unlikely to be an opportunity for aspiring comedians to get started. 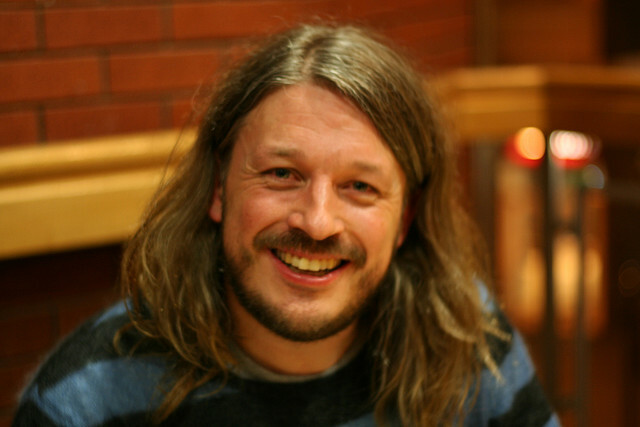 Will other big comedians join Richard Herring in dropping Edinburgh? Could they end up setting a rival comedy festival? Might there be a mass exodus from the Scottish capital? This prospect might alarm supporters of festival fringes who might see this as a threat to the ideals of the open access festival. Well, my view is that I don’t know how likely it is this will happen, but if it does, the Edinburgh Fringe has nothing to fear – and, if anything, it could make the the festival better. Over the last couple of years, I’ve been doing various tips for punters, mainly on how to make the most of the various festival fringes. This year, I’ve not done a new article for the Edinburgh Fringe because there isn’t much that needs updating. So instead, I’m going to concentrate on a specific dilemma that punters face: how do you choose what you want to see at the Edinburgh Fringe? Anywhere else, it’s quite straightforward. You look through the programme, pick out plays that are on at a time and place suitable to you, are affordable, and sounds like your sort of thing. Then you can pick out something from this list. You might go for the play/author/company/venue you like the best, which one has the best reviews, which one is best value for money, or whatever you choose. Regardless of what’s important to you, you make a choice. And this simple method works for Brighton Fringe, Buxton Fringe, any other Fringe, or pretty much any regional theatre scene out of fringe season. But in Edinburgh? Not a chance. Even if you want to see a play in, say, late afternoon somewhere in the city centre, you have gazillions of plays to choose from. In the time it takes you to list them all and narrow them down to the one you want to see the most, you could have seen the damn play. Which means instead you have to make hasty decisions which you may bitterly regret later. Who’d have thought choosing a play could be so complicated? Eeek. Edinburgh Fringe starts Friday and I still haven’t done my list of what I recommend. I’d better get going. This year, I’m going to be a little stricter with recommendations than I have been in previous years. So far, I’ve been listing a mixture of plays I’ve seen before and liked, new plays from groups whose previous work I’ve seen and liked, plays from groups I haven’t seen but I’ve heard good things about, and the odd play I simply liked the look of. However, as my knowledge of fringe regulars has grown, my lists have grown larger. So from 2015 onwards, my new rule for Edinburgh Fringe recommendations is that I have to have seen you before. I’m hearing good things about other plays from too many third-party sources now to be able to handle this consistently and fairly. I will continue to have a more open policy the rest of the year. You can of course increase your chance of a recommendation in a future Edinburgh Fringe by inviting me to review you. Please also remember that I am only familiar with a small fraction of the plays on offer at Edinburgh. There will be plenty of fantastic artists out there who I’ve never heard of. So, as always, think of this as a cross-section of the plays worth watching, not a full list. If you want to see a comprehensive guide to the best Edinburgh Fringe shows, try one of the many reviewing publications – they have whole teams of reviewers that try to keep track of everything. Monday 3rd August, 6.45 p.m.: Welcome to my live coverage of Edinburgh Fringe 2015. This is where you will find all of my snap reviews of Edinburgh fringe plays as and when I see something I recommend. I’ll be at Edinburgh this year on the 8th-10th August and again on the 17th-19th August. Until then, here is a five-day warm-up.